Robometricschool. - One again electronic circuit simulation software that you can use to simulate your electronic circuit project is Quite Universal Circuit Simulator (QUCS). This software will be your reference as your electronic simulation software that you can use to help solve your project now. In this time we want to share with you about Quite Universal Circuit Simulator and then we will give you link to take Free Download Electronic Circuit Simulation Software Quite Universal Circuit Simulator from Robometricschool blog. Quite Universal Circuit Simulator is one of the simulation software that develop to help you to simulate your electronic project this day. 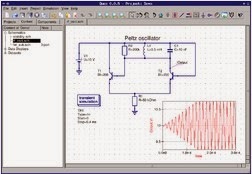 Qucs is a circuit simulator with graphical user interface. The software aims to support all kinds of circuit simulation types, e.g. DC, AC, S-parameter, Transient, Noise and Harmonic Balance analysis. Pure digital simulations are also supported. Quite Universal Circuit Simulator (Qucs) is an open source electronics circuit simulator software released under GPL. It gives you the ability to set up a circuit with a graphical user interface and simulate the large-signal, small-signal and noise behaviour of the circuit. Pure digital simulations are also supported using VHDL and/or Verilog. Qucs supports a growing list of analog and digital components as well as SPICE sub-circuits. It is intended to be much simpler to use and handle than other circuit simulators like gEDA or PSPICE. And you please, you can take Free Download Electronic Circuit Simulation Software Quite Universal Circuit Simulator, using link that we given to you below.